Despite being one of the first truly successful smartwatches, support for the Apple Watch, at least from third-party developers, has been dwindling. But with watchOS 5.0, previewed today at Apple’s World Wide Developers Conference, the company is hoping to breath new life into the platform, while shifting the focus of its feature set back to its core functionality. Unlike the original iPhone, the first Apple Watch came with third-party apps from the start. But the wearable’s app saga hasn’t been quite the same success story as the iPhone’s was. In recent months, many noteworthy developers have pulled their Apple Watch apps from its store. Possibly as a result, watchOS 5 will expand the wearable’s base features, including new health and fitness capabilities. In addition to new fitness tracking modes for activities like yoga, outdoor walks, and hiking (including cadence data for how many steps you’re taking every minute), watchOS 5.0 will let Apple Watch users compete against their Activity Sharing friends through week-long activity competitions. Everyone participating will be able to see their ranking as the week progresses, ideally using it for motivation, and trophies will be awarded at week’s end when the challenge is complete. With watchOS 5.0, the Apple Watch will also be able to more intelligently detect the beginning and end of workout sessions, automatically logging data if you’ve hurried out the door and forgot to hit start, while automatically turning off the tracking when it detects a period of inactivity. The fourth generation (Series 3) of the Apple Watch was the first to get built-in cellular connectivity, letting you leave your iPhone at home. 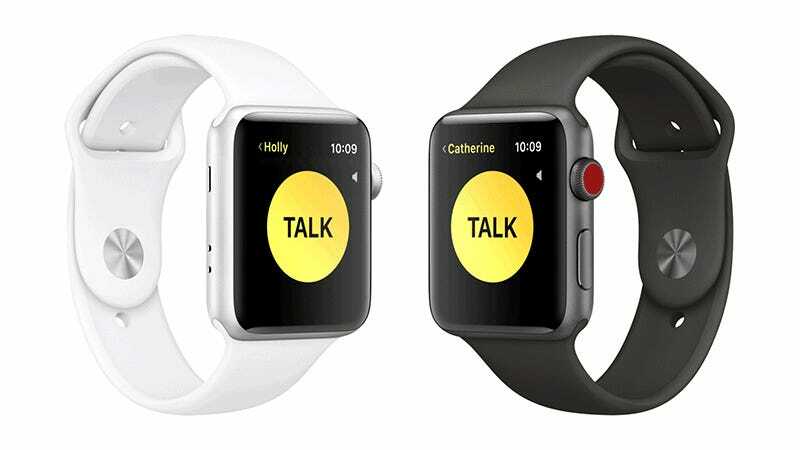 To make it easier to reach out to other Apple Watch users, a new Walkie-Talkie app is being introduced with watchOS 5.0 that lets users send quick voice memos back and forth over a cellular connection, or Wi-Fi. It looks like it’s a faster alternative to placing a call, and may be considerably lighter on data usage. Apple also revealed new features coming to Siri in the forthcoming iOS 12, including customizable shortcuts that can be triggered to complete a series of actions with a single voice command. Those Siri Shortcuts will also be available in watchOS 5.0, and to make Siri on the Apple Watch easier to use, the wearable will no longer require you to shout “Hey Siri!” at your wrists. Simply raising the wrist and talking will soon let the watch know you want it to listen to your commands. In addition to streaming Apple Music directly to your watch and into your Bluetooth headphones, watchOS 5.0 will also finally let you listen to and stay on top of your ever-growing list of podcasts. There’s no new hardware expected for today’s WWDC keynote address, but Apple did round out its watch announcements by revealing a new rainbow strap available for the Apple watch, as well as a new matching watch face that can now be downloaded through the watchOS App Store.